The Space Between Us probably should have been released with the subtitle "When Good Actors Find Themselves in Bad Movies," because that's exactly how I felt when watching this disappointing endeavor. The plot is aimed squarely at the teen crowd, but the script here would insult most grade-schoolers. 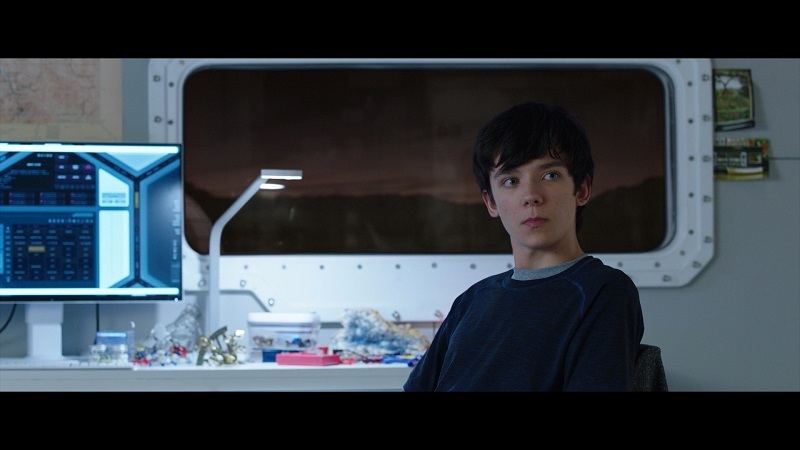 Asa Butterfield stars as Gardner, the offspring of a female astronaut who gave birth to him (and died from complications shortly thereafter) on a manned mission to Mars. 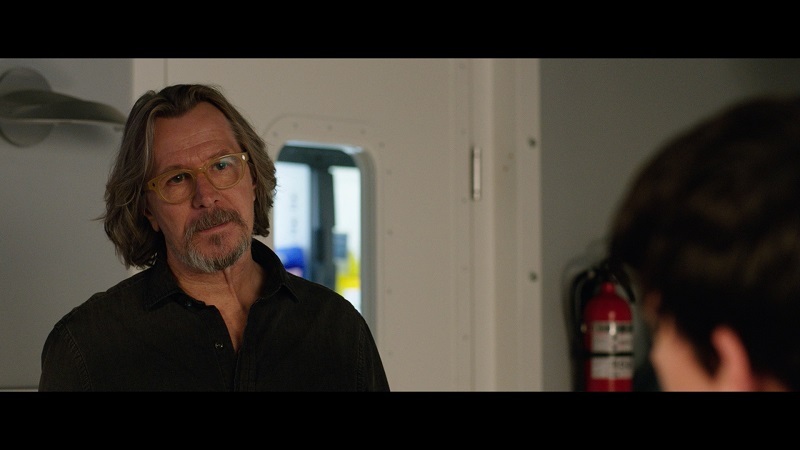 The scientist who headed up the mission (and remained back on Earth) is Nathaniel Shepherd (Gary Oldman), and it was his decision to allow the remaining astronauts to raise Gardner on the red planet (unbeknownst to the public back on Earth) instead of abandoning the mission and having everyone return. Sixteen years after his birth (in the year 2034), Gardner craves returning to Earth, not the least of his reasons being the fact that he's fallen in love with a young girl, Tulsa (Britt Robertson), who he's been Skyping with (or whatever the form of online videoconferencing is in the future) - although she doesn't have a clue that he's not currently on the same planet. Despite the billions of dollars that must be involved to bring him back to Earth (not to mention an operation he gets to make his bones "stronger" after living in the Martian atmosphere all his life), Gardner is returned to our big blue planet. Unfortunately, he's not here for more than a few days before his body starts reacting negatively to his new home. That doesn't prevent him from tracking down Tulsa and having her join him on a search for his biological father, with Nathaniel in pursuit - hoping to find Gardner before his body gives out on him. There are so many problems with the screenplay here, I don't really know where to start. I've already mentioned the enormous cost of sending Gardner back to Earth from Mars (sadly, administrative debate doesn't play much of a part of this movie - and it's totally abandoned during its second half), but there's also the question of how Gardner has instantaneous video conversations with Tulsa back on Earth when it takes around three minutes for light to travel between the two planets. Are we going to have faster-than-light Internet in less than 20 years? And you thought your Comcast bill was high now! There's all kinds of science problems with the movie, but these are the most glaring ones. I had some big issues with the characterization of Gardner as well. Despite Gardner being raised by other humans on Mars (Carla Gugino plays more or less his surrogate mother), the screenplay expects us to buy that Gardner is almost completely clueless about how to act when he arrives on Earth and has little knowledge about the things he'll see there. So he has Skype on Mars, but he doesn't have access to news, books, or anything like that? There's a scene where he watches an old 1950's film about proper manners before he goes to Earth. Was this all that was available? Couldn't he at least find some John Hughes films from the 80s? Having Gardner react to the taste of a hamburger when arriving on Earth is perfectly reasonable. Having him freak out when he sees a horse is not. I've never seen a moose in real life, but I don't think I'd flip out if one crossed my path while visiting Canada. Finally - although this is maybe a little more forgivable given the movie's modest budget - there's really not much of an effort to make The Space Between Us look like it's set in the future. Yes, we get some advanced computer devices and at least one self-driving car. But almost everything else looks like it's modern. This includes most of the other vehicles, the clothes everyone is wearing, and even a scene set in a Walmart where absolutely zero effort was made to switch out any products from what you'd see in such a store currently. Then there's the old motorcycle and dust cropper plane Tulsa's character uses in the movie - which would be old by our standards, but ancient by hers, considering the movie takes place 17 years from now. Even if I were to forgive all of the above problems, the screenplay here is really paper thin. Anyone who has seen the theatrical trailer for the movie knows the basic premise, yet the story takes a whopping hour (of its 121-minute runtime, including the end credits) before Gardner and Tulsa even meet face to face. Their romance seems improbable and unlikely, and there's sadly little chemistry between the two. When Gardner realizes he can't survive on Earth, the movie doesn't even give us the ending viewers will want - as if it decides in its last 10 minutes to finally be plausible. The Space Between Us isn't a horrible idea for a movie, but it's one that needed a few more days in the writing room before it went in front of the cameras. It's really a shame, since I genuinely like the cast here - all of whom we've seen in much better material over the years. Sadly, this movie is never quite able to attain orbit. The Space Between Us lands on home video in a Blu-ray/DVD/Digital HD combo pack. The 50GB Blu-ray and dual-layer DVD are housed inside an eco-Lite Vortex keepcase along with an insert containing a code for one's choice of either a iTunes or UltraViolet digital copy of the movie. A slipcover with artwork matching that of the keepcase slides overtop. Both the DVD and the Blu-ray are front loaded with 30-second trailers for The Bye Bye Man and Before I Fall, an advertisement for Universal Studios Hollywood theme park, plus two additional 30-second trailers for The Resurrection of Gavin Stone and A Dog's Purpose. The Blu-ray's main menu is the typical Universal design, with a still of the box cover image and menu selections vertically down the left side of the screen. The Blu-ray in this release is Region A locked. The Space Between Us was shot digitally on Arri Alexa cameras, and despite the fact that the movie doesn't really wow with its special effects (we need to keep in mind the budget on this movie wasn't exactly astronomical, at a economical $30 million), the image itself is pretty impressive, as this is yet another Universal release with a solid, colorful transfer. This 1080p transfer is presented using an AVC MPEG-4 codec. Details here are pretty sharp, particularly in some of the establishing shots that show the countryside of whatever part of Earth our two lead characters are visiting. There's a short scene in Las Vegas that really sparkles with color and some inky deep blacks, while the pristine white backgrounds of the astronauts' base on Mars are also beautiful to look at. Facial features are both well-defined and natural looking. Other than some minor noise and a touch of banding that creeps into the background of several shots, I detected no other glitches. Despite my disappointment with the movie itself, I've got no complaints about the transfer. While it's not quite a reference-quality one, it's not that far off and provides for a pleasing viewing. The only audio option on the Blu-ray is an English 7.1 DTS-HD Master Audio track that, I must confess, is more impressive than I would have thought, given the production values of this film. They've done a very nice job here by providing some booming LFE use when called for, as well as frequent use of the surrounds for both some occasional immersiveness as well as ambient sounds. The track is also mixed properly, so viewers/listeners need not worry about the dialogue being drown out by any of the noises or the frequently used "pop" music that the creators have stuck (sometimes annoyingly) into the movie. All the sounds have distinct and noticeable separation, making for an impressive (but, like the video, not quite reference quality) presentation. In addition to the lossless 7.1 track, subtitles are available in English SDH and Spanish. Feature Commentary with Director Peter Chelsom - If you're interested in all the details of how this movie came together and was produced, Chelsom provides a pretty informative track here. Sadly - like most commentary tracks of this sort - the director is too close to the material to point out its many mistakes and flaws. But it's still worth a listen and, in many ways, is more entertaining than the movie itself. Alternate Ending (HD, 3:01) - This is less of an alternate ending as it is an alternate version of providing the same material/information we see in the movie's conclusion. It's worth a look, but don't expect a vast difference from what's in the final cut. Deleted Scenes (HD, 13:44) - A collection of five deleted scenes from the movie, with the option of watching them all together or each individually. They consist of: "Nathaniel's Full Speech" (6:31); "Manual Capture" (2:05); "Smaller Than a Lima Bean" (1:13); "Gardner Gets Mugged" (1:28); and "Kendra's Mission" (2:27). Love Featurette (HD, 4:28) - This is a standard "talking heads" behind-the-scenes promotional piece for the movie, featuring comments from Director Peter Chelsom, Writer and Producer Richard Barton Lewis, and stars Asa Butterfield, Britt Robertson, Gary Oldman, and Carla Gugino. There's no denying that The Space Between Us has assembled a quality cast to tell its story, and even has some competent direction from Peter Chelsom. The real issue here is the problematic screenplay, which never really addresses the leaps in logic and reason that take place in order for this film to tell its story. A few more passes/rewrites of the script might have solved some of those issues, but, as presented, The Space Between Us is sloppily put together, and is really only worth your time if you're a big fan of one of the actors here. Rent It.